Using conversation hearts is a fun way to practice graphing skills. Give your child a small box or a handful of conversation hearts. Have him count and graph how many of each color heart he has. Click HERE to print off the worksheet for this activity. (I printed only the first page of the graphing worksheet.) After your child is finished, he can eat a yummy treat. My kids love this graphing lesson! Your child can also use the hearts to create patterns or stack the hearts and see how many he can stack before it falls over. This activity is good for counting and fine motor skills. 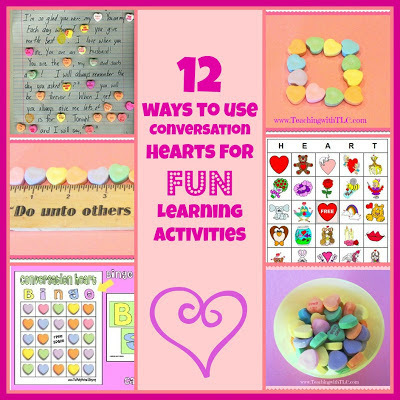 Click here for 12 ways to use conversation hearts for FUN learning activities.